They're called super because experts say these nutrient rich foods are great for your health. Whether it's the good fats packed inside an avocado, the anti aging properties and fiber pumped in a blueberry, or the metabolism boosting carb known as oats, incorporating this list into your diet can help you lead a healthier life. Now, the thing to know about superfoods is that while these foods might pack some serious potential to boost your metabolism or give your body the good fats it needs, they can't work on their own. 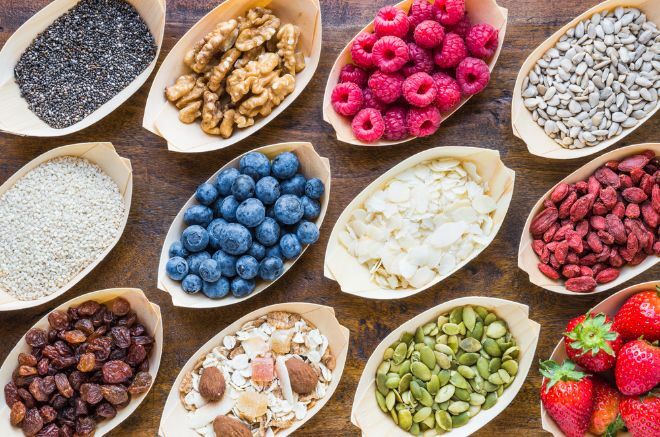 It's important to incorporate these superfoods into a healthy balanced diet, and we think the variety of superfoods we've put together here will help you get started with that. You've probably heard it before: there's good fats and bad fats. Well, this is a good one, a really good one. The monounsaturated fats are great for your heart, and this superfood is also packed with fiber and protein. A study at UCLA revealed that pistachios helped reduce BMI, and improve cholesterol and triglyceride levels. The study was conducted with one group who ate pretzels for a snack every day, and another who ate pistachios. A study published in the journal Metabolism revealed that eating half a grapefruit before a meal can enhance your body's fat burning performance. In some cases - researchers found that people lost an inch in just 6 weeks. It is important to note though, grapefruit can interact negatively with certain medications - so discuss eating it, or eating it often with your doctor. They may be tiny, but these little berries are packed with antioxidants which are known for their anti aging properties, as well as their fiber. Just 1 cup, only 80 calories, can help you feel full. High in protein and fiber, these are the most nutritionally dense nut. Known for making you feel full, and providing the body with much needed nutrients, these are a great snack in between meals - plus, one study suggests eating between 1 and 6 ounces of almonds per day can help reduce cholesterol. Oats are also super rich in fiber - just one serving can help you feel full throughout the work day. Plus, oats are backed with resistant starch, a healthy carb that boosts your metabolism and burns fat. Filled with protein and fiber, a half a cup can also help boost metabolism and burn fat thanks to more of those resistant starches.